At LaRocca’s there’s only one thing we love more than wine-it’s cheese! While it’s difficult to imagine not enjoying a sip of wine with a hunk of your favorite cheese, certain combinations will particularly titillate your tongue and make your soul sing. Join us for a whirlwind class and tasting of 5 wines and 5 cheeses with Arethusa Farms and our Resident Sommelier, Ross Edward Marks. Learn which cheese types best match your favorite wines and get insider tips on how to find the right match on your own. 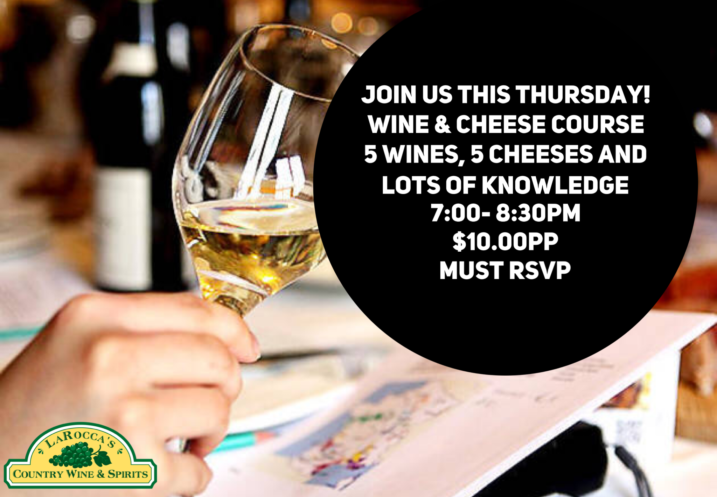 Join us for a pairing session to explicate the essential fundamentals of wine and cheese harmony. Best Part. The class is only $10 and you get to take some cheese home with you. Hope you can join us. We’ve designed our educational events to offer you a myriad of ways to get your knowledge on.